"580 million gallons of gas are used each year for power mowers." The Husqvarna Evolution reel lawn mower is an easy way to save money and the environment at the same time. The Evolution is not your Granddaddy's reel mower. 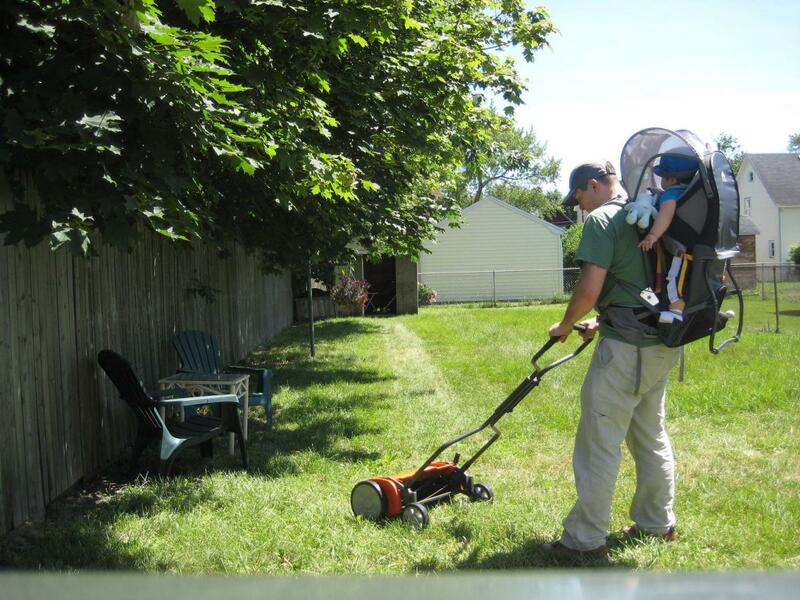 For those of you unfamiliar with what a reel mower is, it is a human-powered push lawn mower. As you steer the mower across the grass, a geared wheel turns a cylindrical reel of spinning blades. When you stop pushing, the mower stops cutting. Best of all, this kind of mower doesn't require gas or electricity. Did I mention that it is quiet? Generally I'm not one for chopping down the verge; however the town fathers do not look kindly at the environmentally extreme. Plus my neighbors with the manicured lawns do get annoyed when things get shaggy on my side of the fence. I try to be as green as possible in my life. I figure that if we all do a few small things, they will add up to a huge savings. 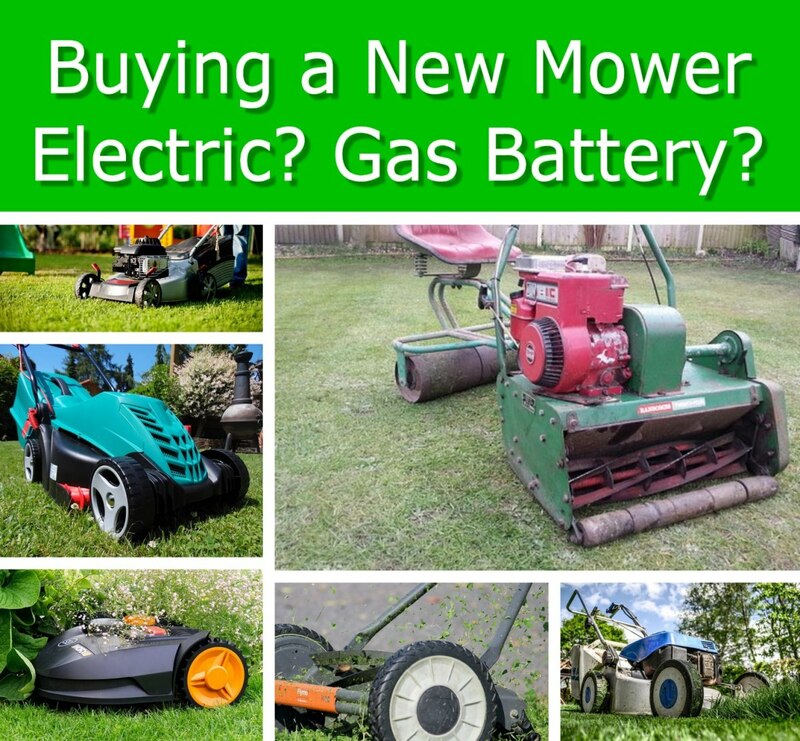 How much greener can you get, than a mower that doesn't use gas or electricity? The Evolution is manufactured under the Husqvarna brand exclusively for Lowes; however, the same mower is sold at Home Depot and elsewhere as the Ellison Evolution. The big difference is that the Ellison Evolution model is green opposed to the Husqvarna orange. 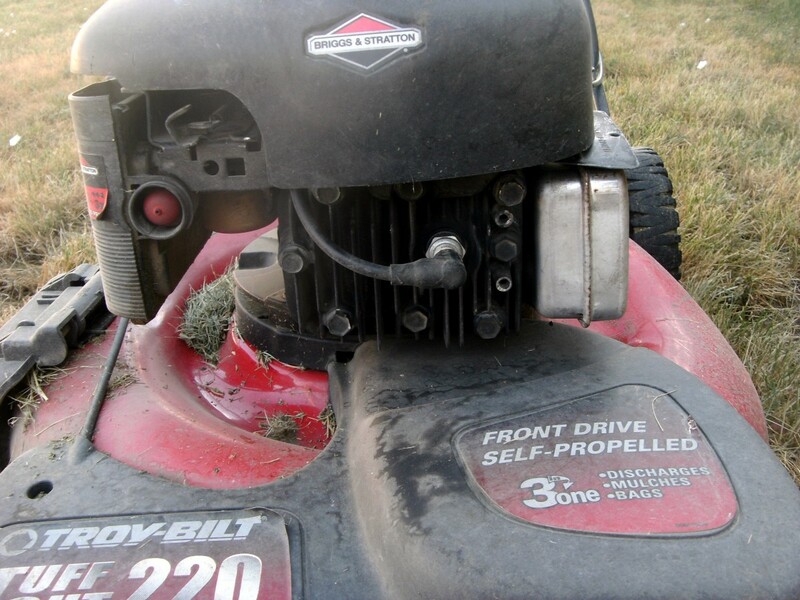 "A (gas) lawn mower pollutes as much in one hour as does driving an automobile for 350 miles." Though my high-school guidance counselor wanted me to be an engineer, I lack interest as well as technical ability in the mechanical arts. Most of my projects end up with me duct taping a broken part or shaving an ill-fitting widget with my pocket knife. I was quite pleased with myself by assembling the Evolution within five minutes of opening the box. Looking at other reviews of this mower, it seems like this quick assembly is the norm. It was a toolless construction project, in attaching the handle to the main mower deck. For the more adventurous, you could probably forgo the instructions. I would heartily suggest glancing at the minuscule manual at least once. 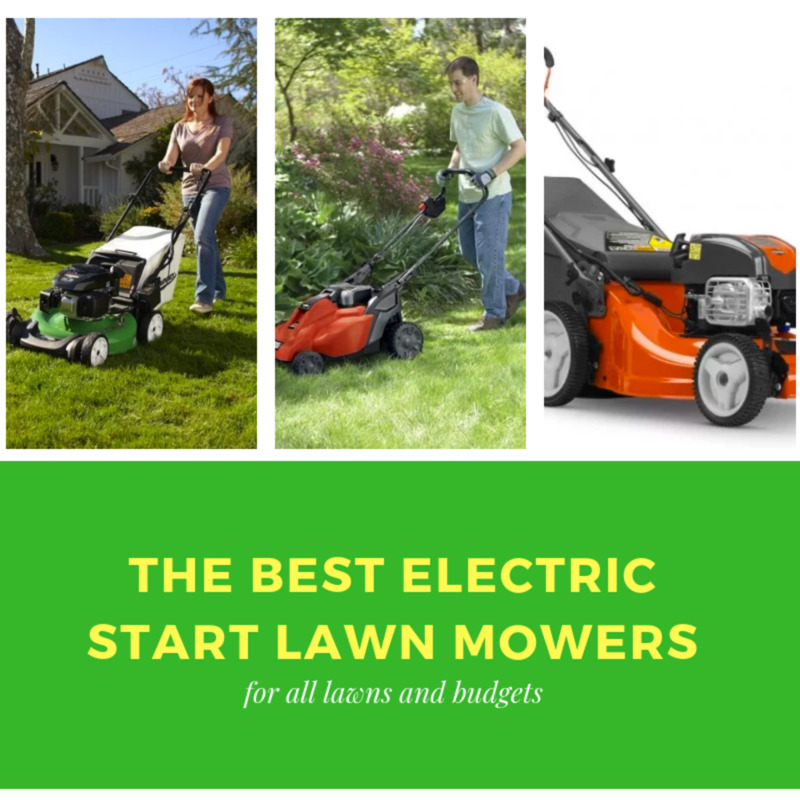 What kind of lawnmower do you use? Anyone that has tried to pull start a gas mower for fifteen minutes during a hot August day, knows the problems that power motors can pose. First you prime, then pull, then fiddle, then yank, then swear, then go back into the house for a beer. On the other hand, the Evolution is easy, just open the shed door, wheel it out, and start walking. This walking part is where the allure of the environmentally friendly reel mower loses most people. Yes, because you are saving on gas, you must push this mower over your lawn. If the grass is especially tall, damp, or flooded with weeds - this pushing will be harder. My advice: if the mower is hard to push, use the one touch cutting height adjustment to raise the mower a little higher. If you really wanted to, I guess you could then go over the grass with a shorter setting. Before the "mowing season" started (for me) I had grass that was 8-inches long is some parts of my lawn. These mini-fields did take two passes - one long and one short - in order to bring the grass to a controllable state. 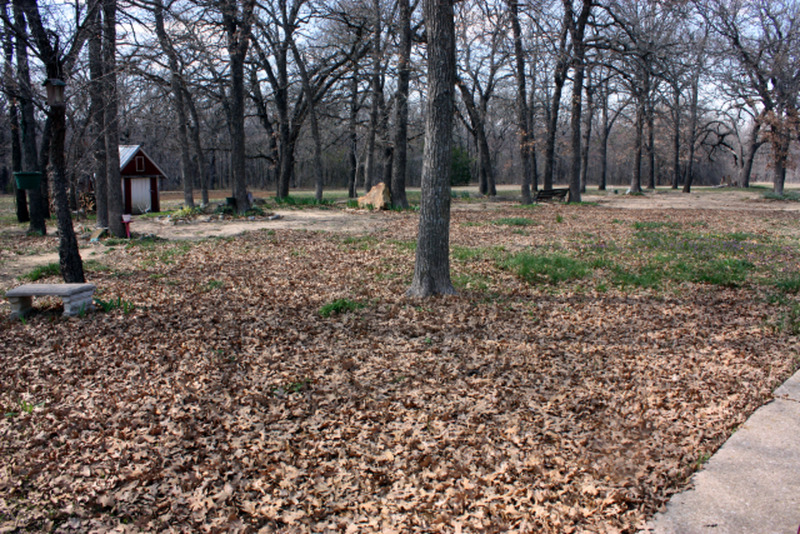 Grass can either be gathered in the detachable grass collection bag or mulched back into your lawn. I've mowed both ways, dumping the clippings into my compost pile, and noticed little difference in the mechanics of pushing. It only takes twenty-seconds to remove or add the grass bag to the Evolution. 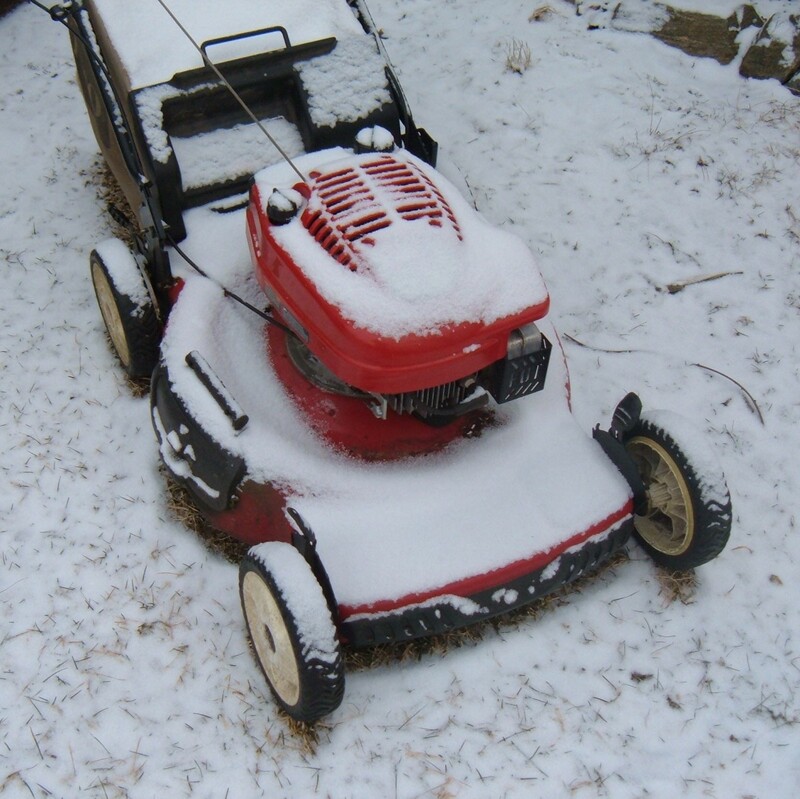 To clean it off, I usually just pick the 32 pound reel mower up and shake the grass off of it. If the grass decides to be decidedly sticky, the grass brushes off easily with a broom. I doubt my lawn will ever win a prize from the local garden club. It is however a shining example of biodiversity with three different types of grasses and an assortment of weeds like a mountain meadow. Depending on the variety of grass, I have sections of my lawn that grow inches overnight and other parts that maintain the consistency of AstroTurf with little work from my end. Apparently some people flatten their lawn with heavy water-filled rollers dragged behind their riding lawn mowers. Like the moon's surface, my lawn is anything but flat, but punctuated by the divots of a years of frost upheavals. The places where the ground gets really bumpy can take a little longer to mow. 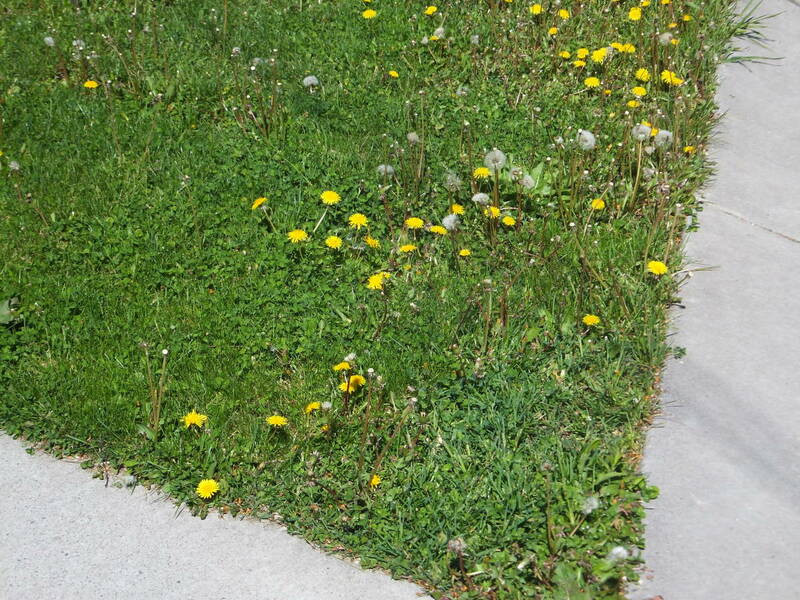 Don't get me wrong, I love the little yellow dandelions that spread across my yard. However, as they grow - my lawn become unsightly as compared to the neighbors' lawns. Sometime, you just have to conform. Reel mowers are notorious for not cutting large thick hulled "weeds" like our little yellow friends that we love to POP the heads off of. In the golden age of reel mowers, my grandfather had a special dandelion digger to rip the flowers out by the roots. How would the Evolution fare? On first pass, this mower cuts about 75% of dandelions on a medium cutting height. If the flowers are prevalent and I'm feeling particularly anti-weedy, I just go back through with the mower one more time. If the grass if already short, I have set the mower on the lowest setting and it seems like it does a better job of slashing down the offenders in my lawn. 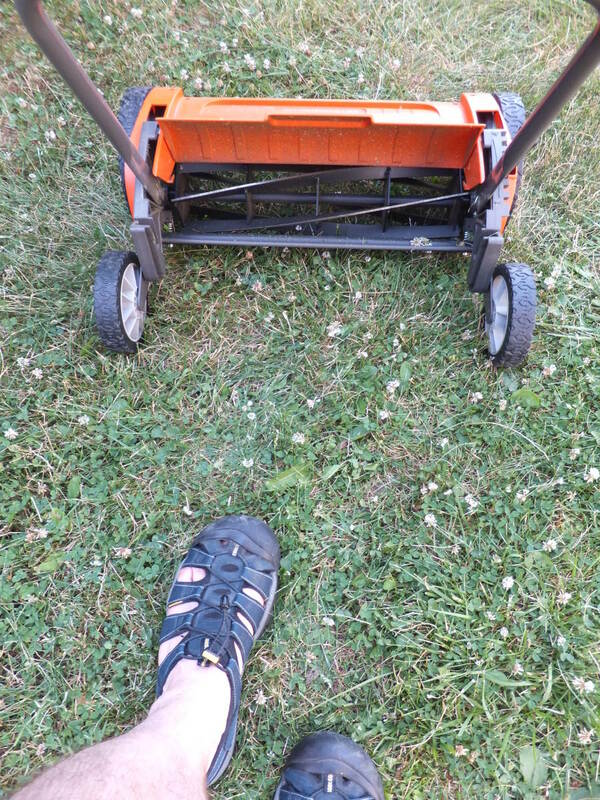 Though I am sure that the occasional moron must somehow insert their toes into a reel mower and hurt themselves, the Evolution seems very safe to use. The cowling over the rotating blades protects the amputation-inclined from temptation. Safety should be concern of all those who cut the lawn, especially with statistics like this one from Consumer Watch. "Each year 80,000 Americans require hospital treatment for lawn mower accidents. The majority of those accidents are associated with children under the age of 15 and adults over the age of 60." The thing is, when you have a a gasoline mower with whirling blades of death gliding across your lawn - you are asking for trouble. Yes, power mowers possess a multiplicity of safety features; however, most of these are easily defeated in the name of expediency. Can be difficult to push in tall grass. Does not cut all dandelions. It can bog down in uneven ground. Not the best choice for larger lawns. With the initial cost, maintenance, and fueling of a gasoline lawn mower, a reel mower like the Husqvarna Evolution is the most economical way to cut the lawn. Besides its money saving features, this mower is an eco-friendly way to reduce the amount of pollution and waste caused by gasoline motors. Investing in a good quality reel mower stops some of the pain at the pump while making a noticeable environmental impact. Just imagine if more people would switch to maintaining their lawn with a reel mower. The cacophony of motorized mowers you wake up to on a Sunday morning could be replaced with chirping birds and the quiet whiz of someone using an eco-friendly product like the Evolution. 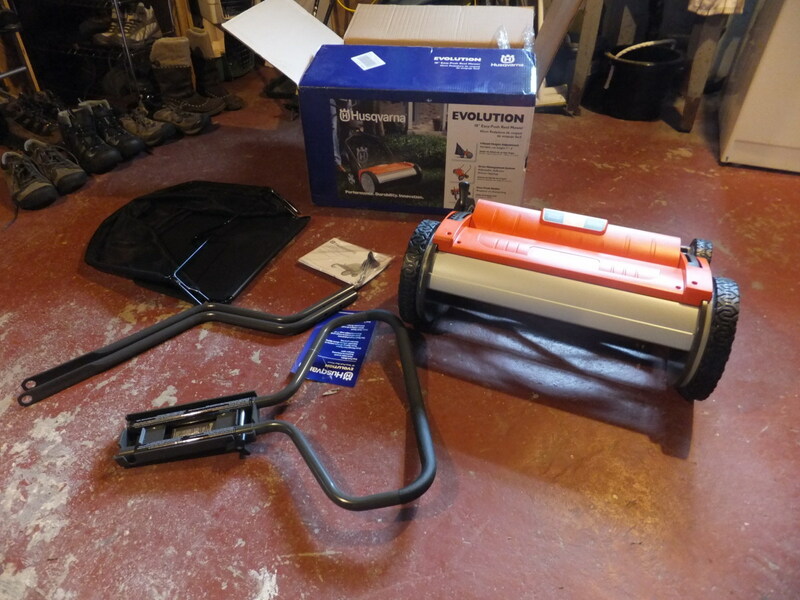 How do you sharpen the cutting blades on the Husqvarna Evolution reel mower? I used a hand file to sharpen the blades a couple of times per year. Yeah, this reel mower is still running strong but I think it is out of production. 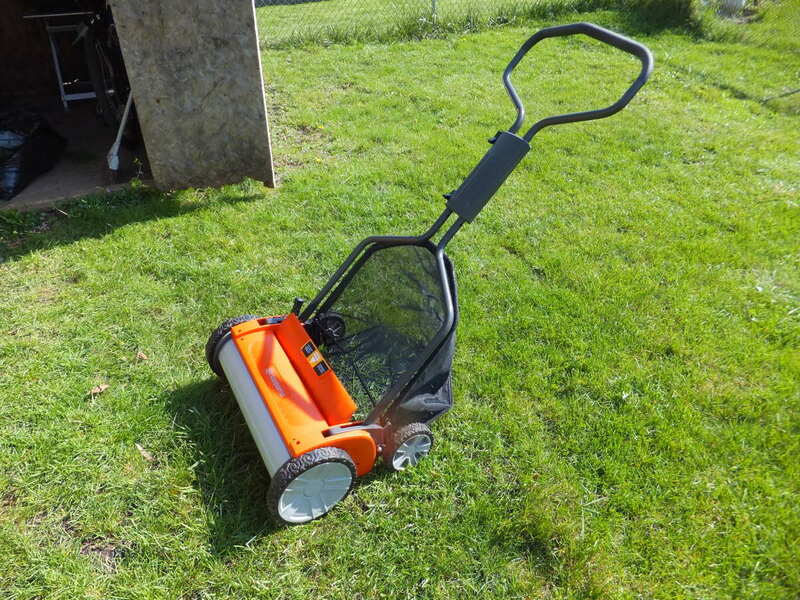 I had a friend that bought a Fiskars Stay sharp reel mower and really seemed to like it. That may be something to check out. OK I was so stoked to go out and buy this mower and it appears to be discontinued. So so sad. Any recommendations? I think the major reason I wrote this article Glenn, was to bring attention to lawn mowers everywhere that there are alternative mowers out there. 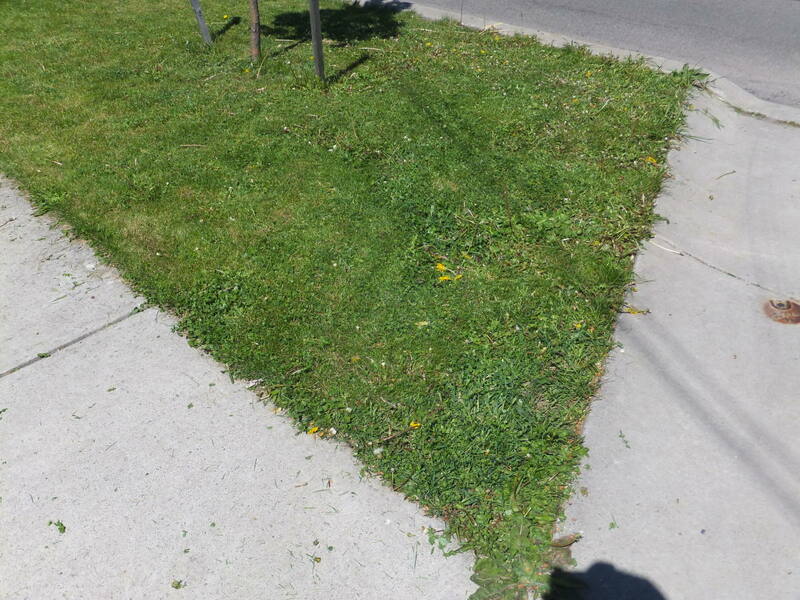 Just imagine the gym membership money you can save by cutting your grass this way. Thanks for commenting! Very interesting and compete review. I didn't even realize that reel lawn mowers still existed. I used to use this type when I mowed the lawn for my parents as a child. I have to admit it's the best way to exercise while at the same time doing this required chore. Something to think about. Though I've seen some reel mowers that have extremely wide cutting decks, they could be tough for larger lawns. I think if I had a larger lawn, I'd look at some of the rechargeable options out there. I was looking at a Black and Decker 36 volt one just the other day. Thanks for reading gardener den! 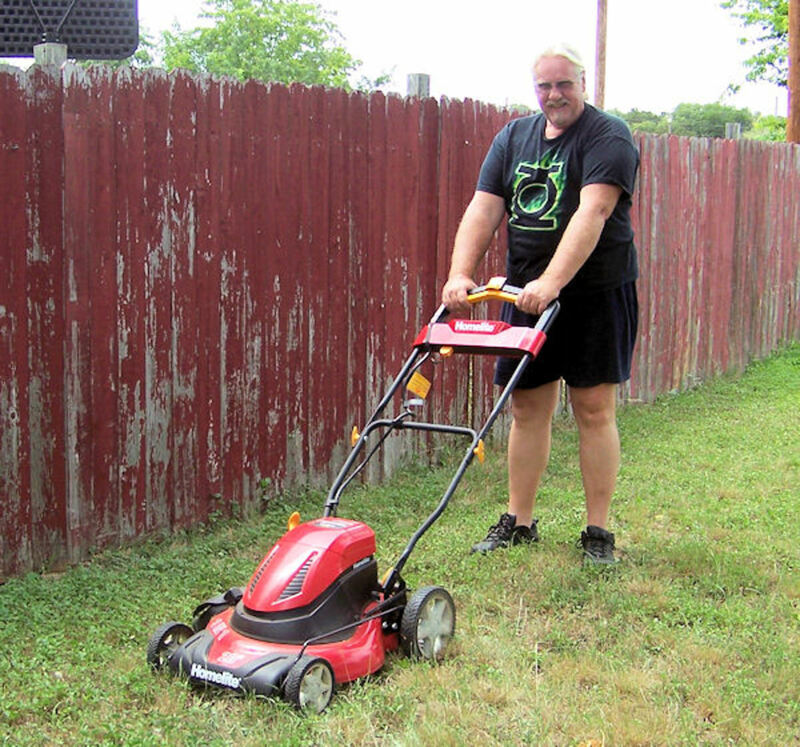 Reel mowers can be a little tough to use with larger lawns. That sounds like quite the project converting your Murray - another way of taking what we have and being greener. Great hub! 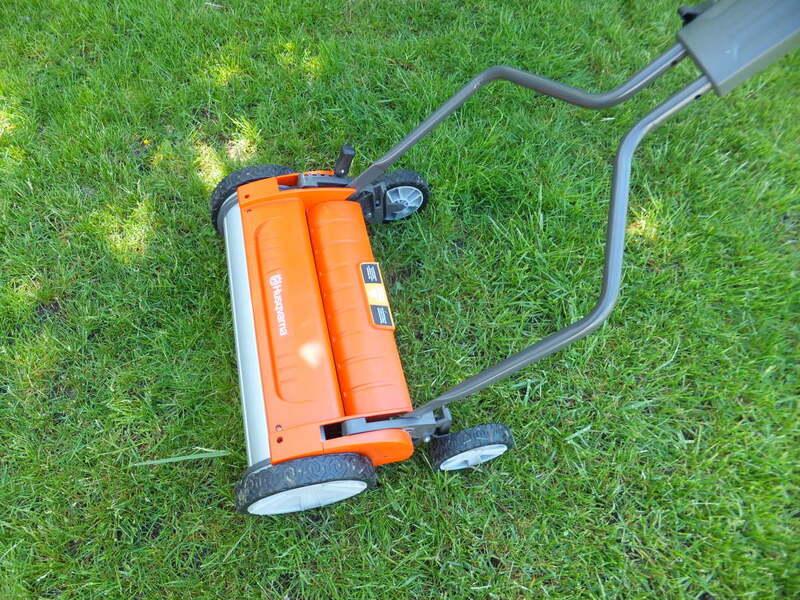 I was originally going to buy a reel mower for my lawn, but the opportunity presented itself, and I bought a used Murray (20 HP Twin II), that I retrofitted to reduce noise and pollution (fumes). It turned out really well, and I'm glad I don't have to push-mow just under an acre. Great hub though, and I look forward to more! Thanks for stopping by coolbreeze! I grew up pushing one! Great hub! Glad you liked it RunAbstract! Like I said, if I can save money and save the environment - it is something I have to do. Of course, as I'm writing this on Sunday morning, I can hear the roar of power mowers in the background. I'm glad you enjoyed Tina! A very good review and it is also a good idea to get some extra exercise and be able to hear natural sounds instead of motor sound. All this at the same time as we can do something to save our environment! Useful, interesting and thanks for sharing! I discovered a new type of flowering grass in my lawn while mowing yesterday. I've been thinking of erecting interpretive signs and giving tours of my backyard. 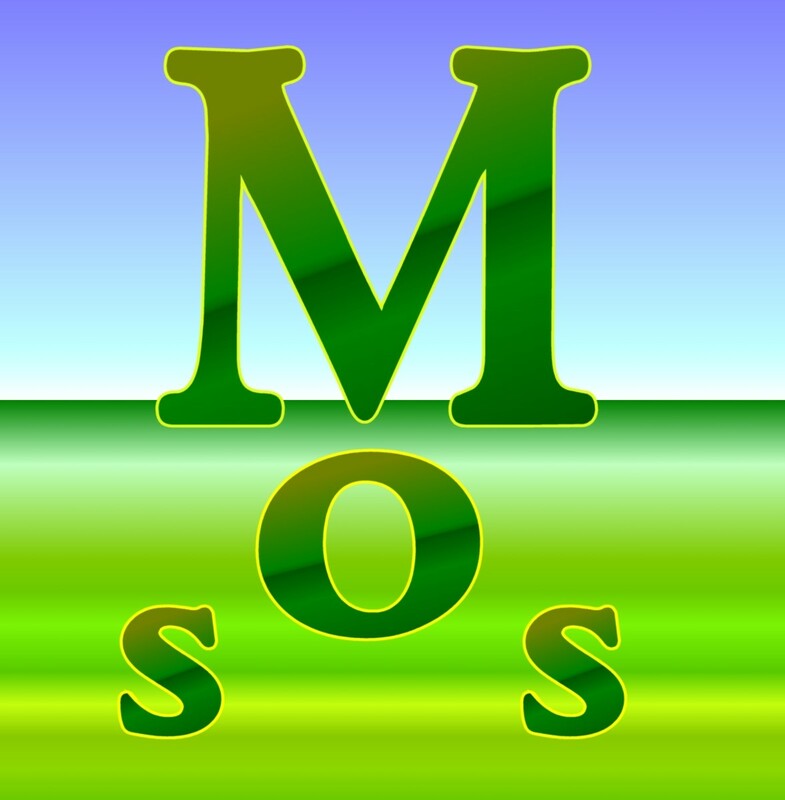 You are welcome for the information and thanks for commenting outdoorsmom76. I like how you describe your lawn as "bio-diverse". Using a reel mower sounds like a good idea, and I had no idea anyone was sill making them. thanks for the info!! My neighbors already talk about me enough (thanks to my experiments in the backyard) I can only imagine what they would say if I started sweeping my trimmings. I remember using my grandfather's reel mower - the thing was a solid piece of steel. It was pretty bomb proof. Exactly Cwanamaker, you can either pay money and go workout in a gym or you can mow your lawn - saving money and the environment. Maybe you could mow other people's lawns too and start a little business. That way you get paid to exercise. I have a push mower that I use when the weather is dry. I used to garden for a lady who insisted I cut her lawn using an original (for that read 1950s) Husky. It still cut well. She also insisted that I use a broom to sweep up the cuttings afterwards, as a garden rake made the lawn look messy. Seeing me use a broom on her lawn gave the neighbours no end of fun and they just loved to make comments. 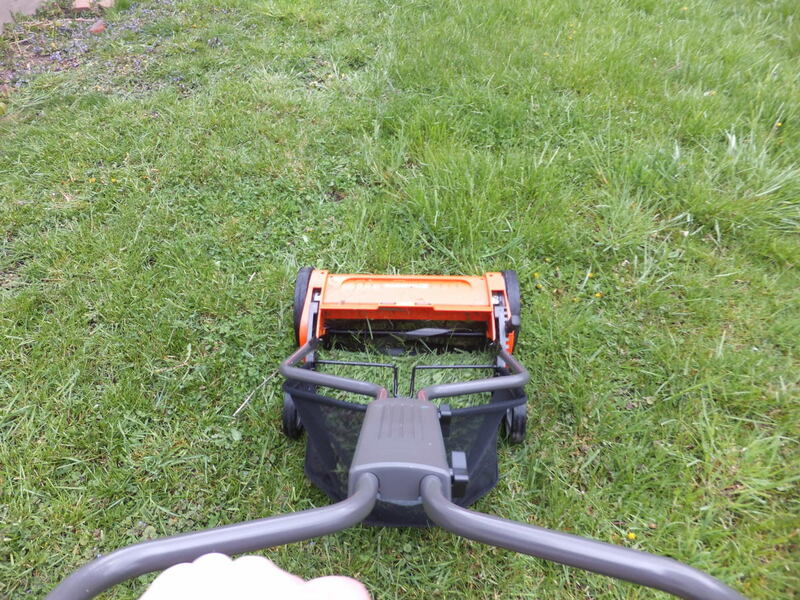 Nowadays I use an electric mower when the lawn is long and too damp, which in the Southwest is most of the time. My modern push mower doesn't cut as well as that old original Husky did. Awesome! I need to get one of these. I look forward getting some exercise when I mow the lawn. Though the old mowers were surely tanks, the new ones are more efficient and easier to use. I almost went with an electric mower, but I'm trying to do as much as possible without using any power. Wow, I was thinking about getting a push mower but thought I'd have to buy an old one and restore it! I've got an electric at the moment but winding out and then winding back the cord takes about as long as it does to cut the grass.